It was 60 years ago today (July 6th, 1957), in Liverpool, England, that the most successful and beloved songwriting team of all time -- John Lennon and Paul McCartney -- first met, kick starting the Beatles' career. McCartney was brought to the St. Peter's Church Garden Fete in the Liverpool suburb of Woolton by his and Lennon's mutual friend Ivan Vaughan, to watch Lennon's group the Quarrymen perform. Vaughan recalled to Lennon biographer Ray Coleman that he told McCartney: "You've got to come and meet this guy John Lennon. You'll get on well with him." In recent years, McCartney has revealed that he had seen the older Lennon around Liverpool more than once and took notice of his hardened "Teddy Boy" dress and demeanor. Vaughan said that the 15-year-old McCartney was more interested in checking out the girls attending the Church social than the musical acts. At the moment that McCartney first laid eyes on the 16-year-old Lennon on stage, he was performing the Del Vikings' hit "Come Go With Me" -- with almost completely improvised lyrics. After the Quarrymen's set, the left-handed McCartney impressed Lennon and the rest of the group by turning over one of the group's right-handed acoustic guitars and belting out a few Little Richard numbers and Eddie Cochran's "Twenty Flight Rock." Lennon was immediately impressed at the number of chords McCartney knew, as well as his ability to remember the correct lyrics to the songs. In 1964, McCartney jokingly described the historic meeting in the forward to Lennon's first book, In His Own Write, recalling that, "At Woolton village fete I met him. I was a fat schoolboy and as he leaned his arm over my shoulder, I realized that he was drunk." In 1967, Lennon recalled his first impressions of McCartney, remembering that, "I was very impressed with Paul playing 'Twenty Flight Rock.' He could obviously play guitar, I half thought to myself, 'He's as good as me'. . . He also looked like Elvis (Presley). I dug him." Throughout the years McCartney has always maintained that the meeting was one of the most amazing twists of divine intervention: "I kind of just count my blessings, y'know? I feel very lucky -- and there is so much fate involved. Y'know, my friend Ivan Vaughn taking me to Woolton village fete, me seeing John there, me going backstage -- talking to him, me happening to know the words to 'Twenty Flight Rock,' him happening to be impressed. Don't ask me about conclusions aboutlife -- never mind the Beatles' career -- or that aspect of it." 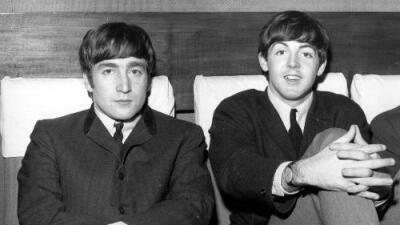 Ivan Vaughan, who stayed friends with both Lennon and McCartney over the course of their lives, went on to study the classics at University College, London. His wife transcribed McCartney's English lyrics to French for the Beatles' 1965 classic "Michelle." In 1968 he briefly worked for the Beatles' Apple Corps. helping out with the short-lived and ill-fated planning of an "Apple School." In 1977, Vaughan was diagnosed with Parkinson's disease, and in 1986 published a book, Ivan: Living With Parkinson's Disease. Vaughan's eventual death in 1994 due to complications from the disease inspired McCartney to begin writing his first book of poetry, 2001's Blackbird Singing, which included a poem titled "Ivan."